Enter the Simon Malls Back To School Sweepstakes right now at mallsbacktoschoolsweepstakeshp.splashthat.com for your chance to win $3,000 Simon Gift card. How To Enter: Go to this link:simon.com/StyleCoveredSweeps and follow the online instructions to register by entering all information requested on the registration form and once you filled out the entry form now Click on the submit button to complete the registration form. Prizes: One grand prize winner will win a $3,000Simon Gift card. Approximate Retail Value(“ARV”):$3,000.ONE (1) FIRST PRIZE: A $500 Simon Gift card ARV: $500.ONE (1) SECOND PRIZE: a $250 Simon Gift card. ARV: $250. Who Can Enter: This sweepstakes is open only to legal residents of the forty nine (49) United States and District of Columbia who are eighteen (18) years of age or older at the time they enter the sweepstakes. When To Enter: The Sweepstakes entry begins on July 19, 2018 at 12:00a.m. Eastern Time (“ET”) and ends on August 29, 2018 at 11:59 p.m. ET. 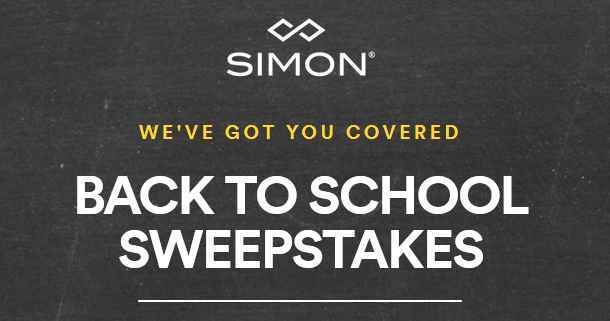 Who’s Sponsor: The Simon Malls Back To School Sweepstakes is sponsored by Simon Management Associates II, LLC, 225 West Washington Street, Indianapolis, IN 46204.